In the fall of 2004 we moved back to Iowa for M to finish undergrad. In my own student days I had ridden my old Bridgestone MB-5 all over the Grinnell area, but not in an especially regular fashion. I sold that bike upon graduation (which was a mistake), and a bought a road bike which was too small for me (and M has to this day). Before leaving Utah, I bought our friend and roomates Cannondale XS800 (?) a pretty blue cross bike with a headshok that had an awesome 40mm of travel. 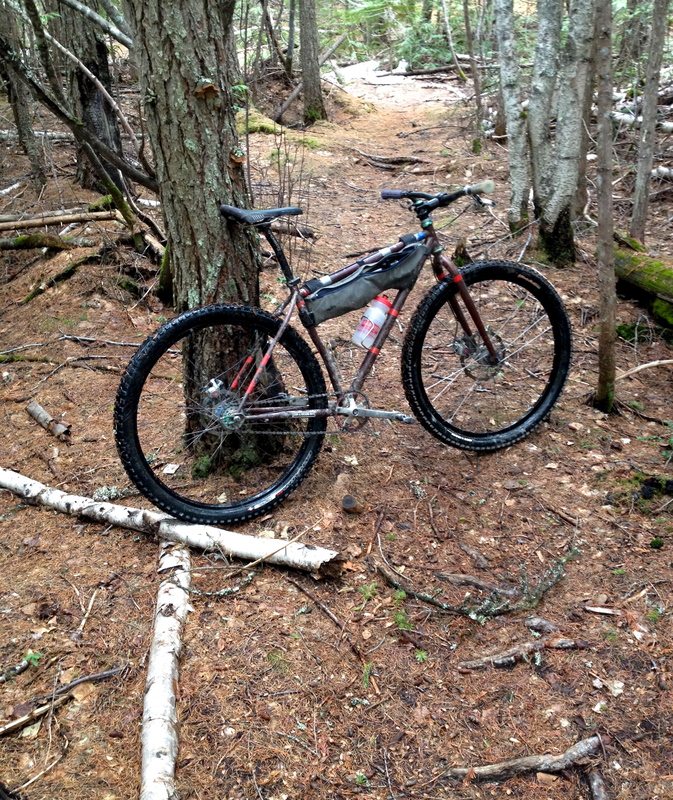 That bike was a great gravel road bike, and a good platform for learning to wrench and fiddle. It got a lot of miles put on it in 2004 and 2005, RAGBRAI included. In the fall of 2005 I was wanting a proper mountain bike again, had learned about MTBR, and saw a used singlespeed conversion in a local shop for a couple hundred bucks. It was a blaze yellow Gunnar Rockhound, with a crap suspension fork and a bunch of other mostly decent components, all in garish colors. I bought it, modified it like crazy, wishes I could put disk brakes on it, and rode it like crazy. 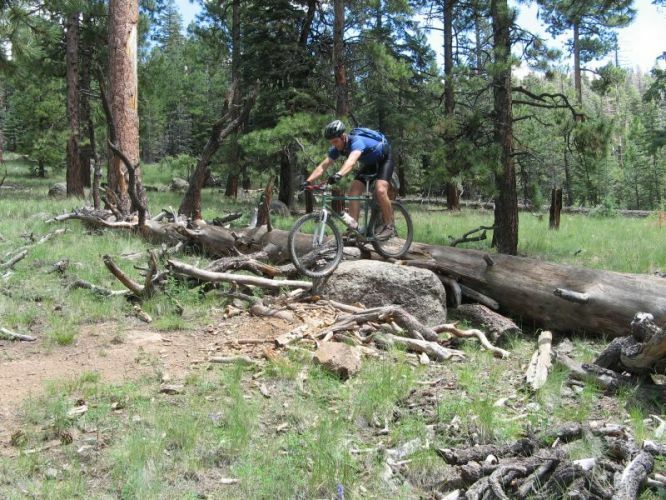 In 2006 we moved to Arizona, and late that year I bought my Karate Monkey, which I rode this afternoon. I don’t ride all that much anymore (at least big rides), which has been a blessing, as I can’t justify the cost of more parts for further futzing. Thus, the monkey has remained as you see it above for the past four years, especially since my old Reba died of old age. It’s not all that different than the Gunnar as I ran it back in the summer and fall of 2006: big knobby tires, rigid fork, Oury grips, gear inches in the low 40s. Disk brakes, clipless pedals, and big wheels are the only real changes. All welcome, but I could probably get along without them. I’m not sure if I’d give up disks or clipless first. The learning process has been invaluable, and I like being able to troubleshoot a drivetrain or press in a headset with confidence. However, it’s important to remember that riding is the important part, and with bikes its easy to spend lots of time and money going in circles, when the original tool would have worked just fine, and not impeded the learning process at all. Great last sentence to end it. With so many bike industry changes from tapered steer tube, 2×10, 1×11, 15mm axles. Your statement put it back in perspective what it’s about. Of all the new products from the last 5 years, XX1 and the Surly Krampus are the only two I find intriguing. Once 1×11 migrates down to the X9 pricepoint I’ll be all in. Mostly, I see 4k bikes becoming the new normal, which if not a dead end, is at least a very intentional narrowing of the market. Then again, in my book indexed shifting remains a retrograde move.